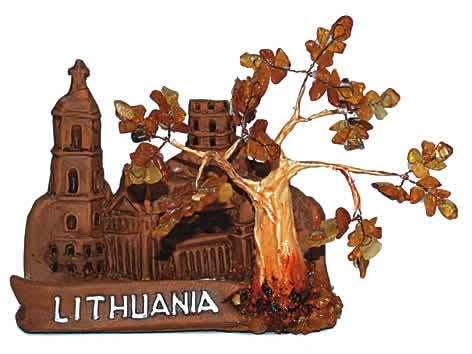 Lithuania’s guests usually take out amber decorations, linen tablecloths, napkins or clothes, several bottles of Lithuanian national drinks, natural honey or earthenware. Jewelry made of amber – bracelets, rings, necklaces, key rings are among the most popular souvenirs from Lithuania. Though it is more expensive, one can be lucky to find amber with insects from millions years ago trapped inside it. Linen dresses, jackets, jumpers or bags are very popular among Lithuanians and they are not expensive ones. A linen dress with an amber necklace or bracelet looks very nice. Embroidered linen tablecloths and napkins will be a wonderful decoration of a dinner party. Lithuania has its own set of liqueurs admired by foreigners. Those searching for some national drinks buy "Lithuanian mead" which is made of honey and some herbs or "Krupnikas" – the strong honey liqueur as well as the multi-fruit-based liqueurs such as "Palanga" or "Dainava". Natural Honey – beekeeping in Lithuania seeks even XIII cent. Since then Lithuanians started to use honey in their homes for health and as trade with arrivals for goods. Nowadays honey is one of most popular gifts for friends as wishes for healthy life and love for newly married couples. Also it is used in wellness centers for relaxation and treatment. You can always ask recipes, how to use honey for healthy or relaxing drinks. Earthenware, perhaps, the oldest Lithuanian folk art form. Found pottery is very old and has a great archaeological investigation of the origin of the Lithuanian nation. Household and applied art works are found in Lithuania and the primitive communal regime period. One of the oldest branches of Lithuanian folk pottery is characterized by resourceful artistic forms, expressive silhouettes, interesting decorative motifs and compositions, occasionally and colors.